Sorry for not writing a Music Review in a while, but I'm hopefully going to redeem myself today by reviewing Leauges. 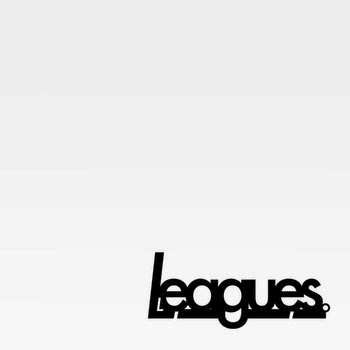 EP by London band Leagues. This 5-piece rock band from London, consisting of members Adam, Rhys, Josh, David and Dan started off as two strangers who met at Reading Festival in 2010 and decided that the Alternative Rock genre was missing a vital piece of the puzzle, so Leagues. was formed. They brought in 3 other members and their line-up was complete. After a long time with playing support sets for other Alternative bands, they finally got their break and released their 4 track EP, simply called "Leagues. EP". With their biggest and most anticipated show at Slam Dunk Festival being their most successful achievement to date, what else is on the horizon for this 5-piece alternative rock band? The opening song from the EP, No Chance Of Failure starts with very strong, heavy guitars which is always a good sign at the start of a song, showing that the rest of the song is going to be good. The song is delivered very much like a rock song, with the chorus being sung quite angrily and with the guitars being somewhat louder than the vocalist, which is my only letdown with that song, as sometimes you can't really hear what he's saying unless you turn the volume up. The message of the song is a good one, to break free with no chance of failure. Carry The Sun also contains very heavy guitars and strong vocals, which you can actually hear. The chorus, however, reminds me of a Heavy Metal song, with the use of shouting and that's not a good mix for a rock band. The message of the song is a bit confusing to be honest, as I didn't really know what it was. The lyrics were interesting though, describing how the singer is suffocating in a room of smoke and how he is carrying the sun. Hollow is my favourite song of the EP, as it has a message that everyone can relate to: having poison through our veins and being empty on the inside. Okay, maybe not everyone can relate to this, but most people have gone through troubles in their lives that makes them empty inside and feel like nothing. The lyrics were delivered very well, with a great guitar solo and chorus sung with everything the lead singer has got at the end. Misguided Hope is another great song, with a very simple message: that the person he's talking about has been taken away from you and he wants her back. Also, that he is burning in their heart and deserves a second chance. This song is delivered again with great vocals from the lead and a very catchy beat and chorus, which will have everyone singing along eventually. Overall, I think this band has a great future ahead of them and will be big. However, some of the songs didn't do the band justice, as some of the lyrics couldn't be heard or understood, but that is my only criticism. You can listen to this EP on their Bandcamp site, follow them on Twitter and "Like" their page on Facebook.